My favorite comeback to this is one I heard many years ago from one of the local guides, and it is: "Then satan has converted!". Scripture tells us that you will know by their fruits. And the fruits of Medjugorje are amazing. Over 30 million people have visited Medjugorje since the apparitions began in 1981. I have personally witnessed countless dramatic healings of mind, body, and spirit there over the years. I have been in a parish office in Medjugorje where there are volumes of medically documented healings. I have seen countless conversions to a deeper Catholic Faith, conversions to the Catholic Faith, or simply conversions back to God. Take a look at who is involved with Adoration of the Blessed Sacrament at church, who is involved with prayer groups, attends daily Mass, is on fire with their faith. 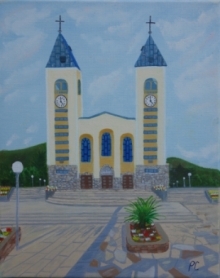 It is many times someone who has been to Medjugorje. This new breath of life is the grace that is extended to everyone who asks. Our Lady has repeatedly said that "This is a time of grace." We must take advantage of it!